The Mesa County Commissioners honor former Colorado Parks and Wildlife northwest regional manager in public hearing on Monday, August 18, 2017. Ron Velarde served with integrity and distinction through June 30, 2017. Commissioners John Justman (left), Scott McInnis, and Rose Pugliese (far right), present Ron Velarde (center) and his daughter Megan, with a proclamation in honor of his 47 years of public service. Many Colorado Parks and Wildlife staff members came to public hearing in support of Ron Velarde and his admirable dedication and leadership. Ron Velarde (right) expresses his gratitude to the commissioners for honoring him and for their many years of collaboration. Ron receives a well-deserved standing ovation in public hearing. Read the full proclamation here. 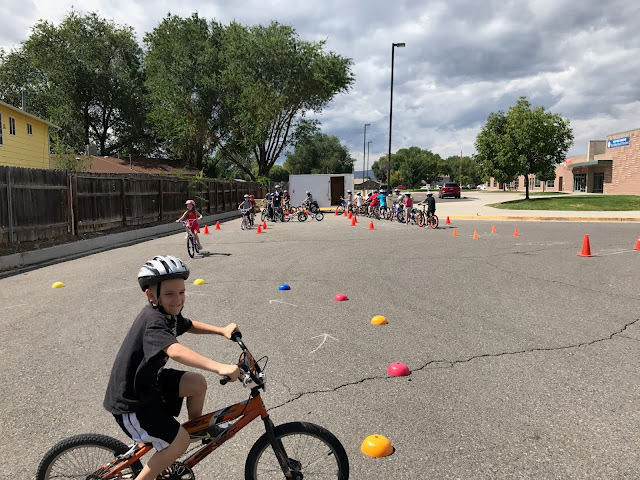 Pear Park Elementary has kicked off the school year teaching students road-safe bicycling and walking skills through the Safe Routes to School (SRTS) program. The goal of SRTS is to enable more children to walk and bike to school more often. This is the fifth year that Pear Park Elementary has taught SRTS to students - reaching over 1,500 children at this school alone. 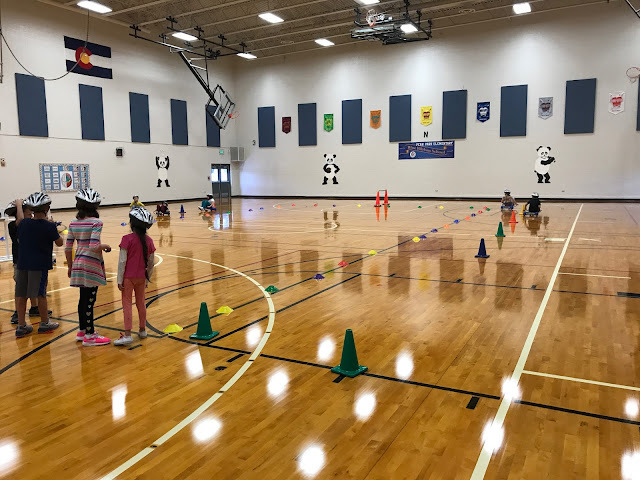 Many District 51 schools utilize the SRTS program each year. For more information about the SRTS program, please visit http://rtpo.mesacounty.us/. Pear Park Elementary students learn about road-safe bicycling and walking skills through the Safe Routes to School (SRTS) program. 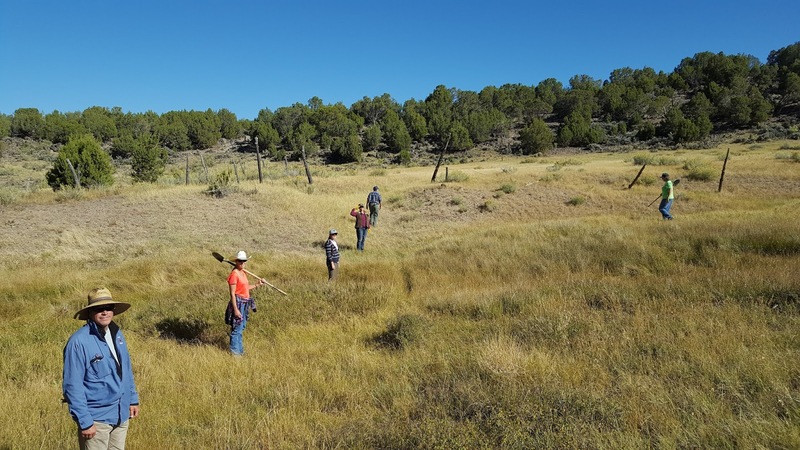 Learn more about the SRTS program at http://rtpo.mesacounty.us/. Mesa County Criminal Justice Services Department (CJSD) Clinical Director Jason Talley (left) briefs the commissioners on a new software program his team has been helping develop. Mesa County CJSD Director Dennis Berry and Deputy Director Matt Sullivan give the county commissioners and administrator departmental updates and take questions before taking them on a tour of one of their buildings that is under construction. Mesa County CJSD is expected to move female offenders to the newly remodeled women’s community corrections facility, also known as Chipeta, by the end of the month.The 9,100-square foot, 41-year-old, building at 436 S 7th St., has been under construction for just under a year. The much-needed renovations address plumbing issues, lack of space and safety concerns for clients and staff. Commissioner John Justman looks around at the renovations underway at Chipeta. Read more about the improvements at https://goo.gl/1rHQRJ. 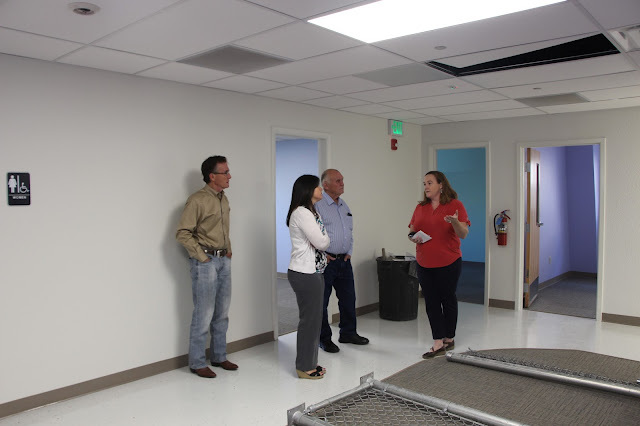 The Board of Mesa County Commissioners take a tour of the Chipeta building on Tuesday morning, lead by CJSD Operations Manager Michelle Cooley (right). Work is nearing completion on the restoration of the women’s community corrections facility. 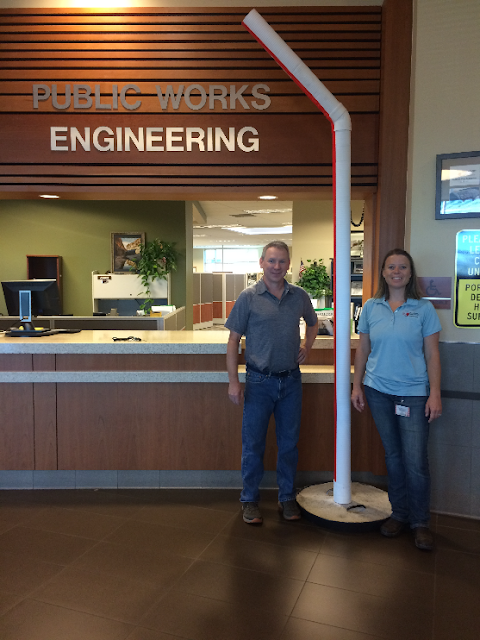 A giant straw is delivered to Mesa County Regulatory Programs Manager Carrie Gudorf (right) to be used as a prop for stormwater education. Noxious Weed Management scout for invasive yellow starthistle above Mesa with partners from US Forest Service (USFS), Colorado State University (CSU) Extension and local residents. 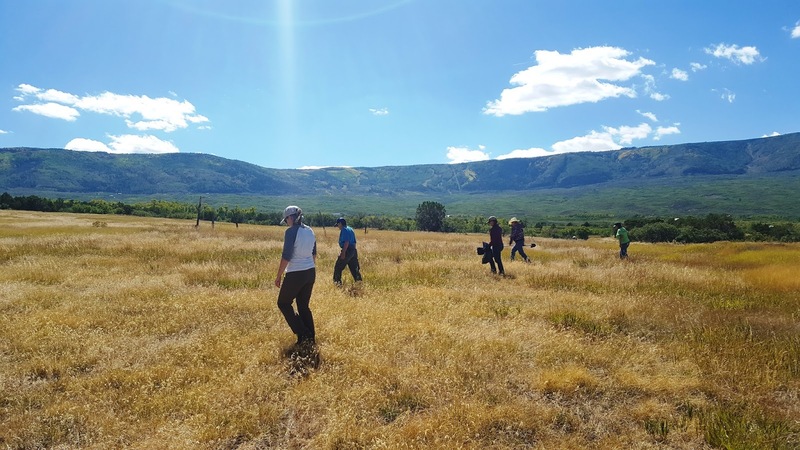 Members from Noxious Weed Management, USFS and CSU Extension scout for yellow starthistle above Mesa. 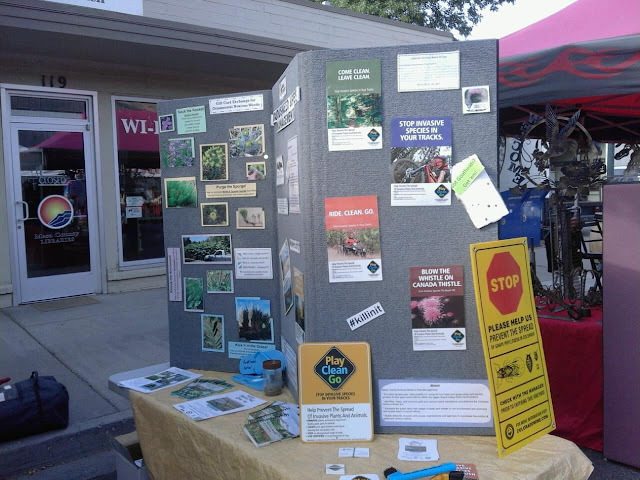 Teresa Nees with Noxious Weed and Pest Management visited with locals and tourists at an information booth on Sunday at the Palisade Farmers Market. 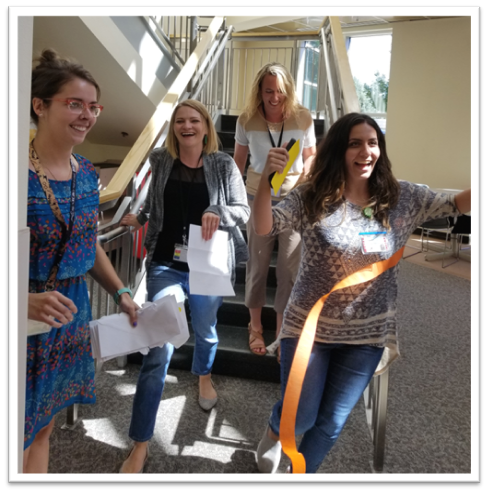 Teams of four traveled from place to place at the Community Services campus to complete activities and figure out clues to determine their next destination, all to benefit the United Way of Mesa County. The "Amazing Race," sponsored by the Fun Bunch, awarded the fastest team. The entry fee was a pledge for United Way. Each team took about 25 minutes of their lunch hour to compete. Pictured here: Arminel Estevez and Dalys Otberg Head out to their first destination during the race. 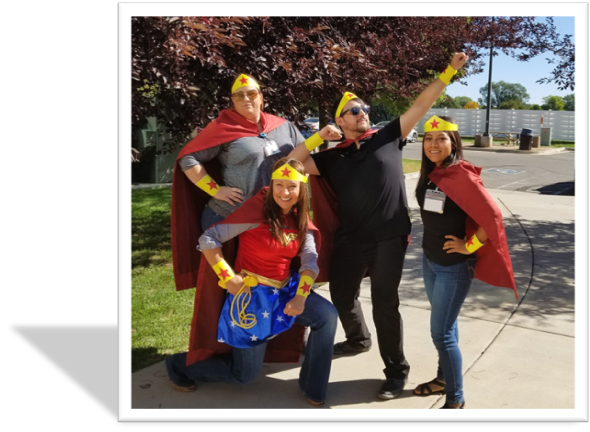 Katie Vanderberg, Brandi Ehlers, Sandra Acevedo, Andrew Escamilla reveal their superpowers by competing in a costume contest to go along with United Ways's theme "Once Upon a Time." 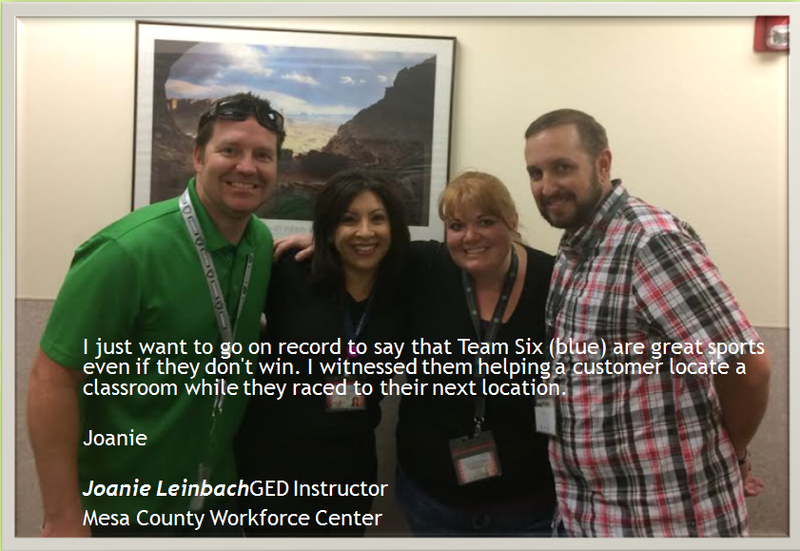 Amazing Race Winners! Congratulations, Kiira Moore (left), LeeAnna Tallman, Bridgett Mancera, and Lilian Madadian! Mesa County Public Works is studying the cost and environmental effects of connecting O Road between 13 and 14 roads and between 17 and 18 roads. The open house aims to share information regarding the study and gather citizen input. Renovations at the Mesa County Animal Services facility are close to completion. This week the shelter got a fresh coat of paint. Painting of the kennels is now complete. Progress at the shelter continues, construction and improvement are expected to conclude by the end of November 2017. Mesa County Assessor's Office Appraisers April Hardy and Steve Henderson set up the multi-purpose room at the old Mesa County Courthouse in preparation of the 2nd Annual Assessor's Office Chili and Brownie Cook-off to benefit the United Way. Mesa County Assessor Ken Brownlee helps staff get the room ready for the Chili and Brownie Cook-off to benefit the United Way of Mesa County, which benefits our neighbors and friends in need through a variety of supportive organizations in our community with a focus on health, education, and self-reliance. Chili Cook-off attendees enjoy from over 10 different chili recipes! In conjunction with the cook-off, a handcrafted item silent auction was held to help raise funds for United Way of Mesa County. Handcrafted items were donated by talented county employees to help raise money to help our community. Mesa County Assessor's Office Administrative Coordinator Jessica Sander-Cederlof brought fresh chilies from her garden to share at the 2nd Annual Assessor's Office Chili and Brownie Cook-off to benefit the United Way. Chili, brownies and decorations are in place. Let the cook-off judging begin! 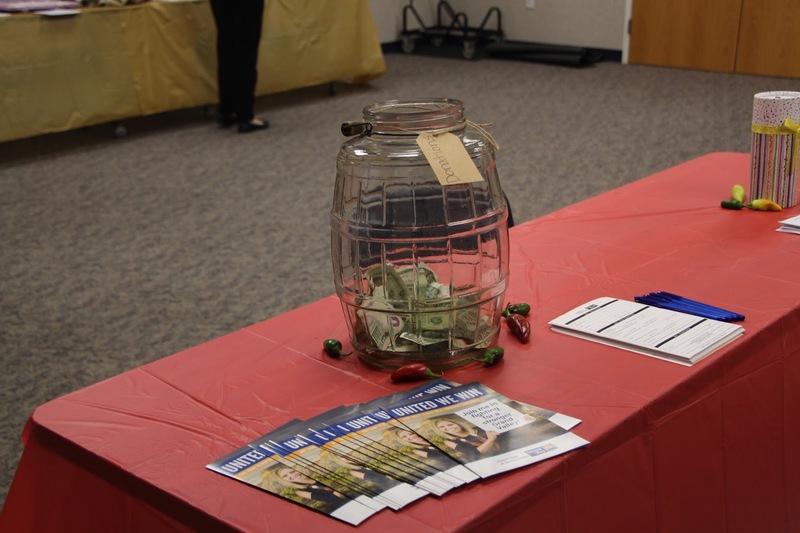 As of today, through generous Mesa County employee contributions, we have raised over $7,000.00! Six varieties of brownies compete for the first place title. Mesa County Appraiser Janell Hutton made a scrumptious Black Forrest Trifle Brownie Bowl, but she did not enter the contest. She could've won! Mesa County Assessment Cartographer Jane Hilt made a delicious green chili and brought garnishments on the side. Excellent presentation! Mesa County Assessor Ken Brownlee adds a special ingredient to his chili. What can it be? No, his secret ingredient isn't his mustache, but close. It's "Reckless Love," which does have a mustache on the bottle. So, technically even his chili has a mustache. If chili isn't spicy enough, add more spice at your own risk. Crockpots full of beautiful colors and aromas kick off the fall season and help raise money for a good cause. Mesa County Senior Human Resources Analyst Krista Ubersox tries a few chilis before making her final selection. 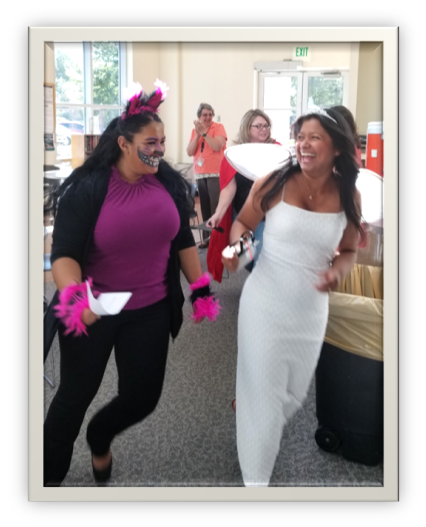 Mesa County Traffic Technician Nichole Frazier (left) and IT Customer Interaction Manager Lhana Jordan catch up at the 2nd Annual Assessor's Office Chili and Brownie Cook-off to benefit the United Way. Mesa County Chief Deputy Assessor Brent Goff (left) chats with Commissioner Justman at the Chili Cook-off. Appraiser Janell Hutton tallies up the votes to reveal the 2nd Annual Assessor's Office Chili and Brownie Cook-off winners. Congratulations to Dianna Valdez for taking first place with her delicious green chili, and Jessica Sander-Cederlof who took first place for her amazing Oreo brownies. Congratulations, ladies! 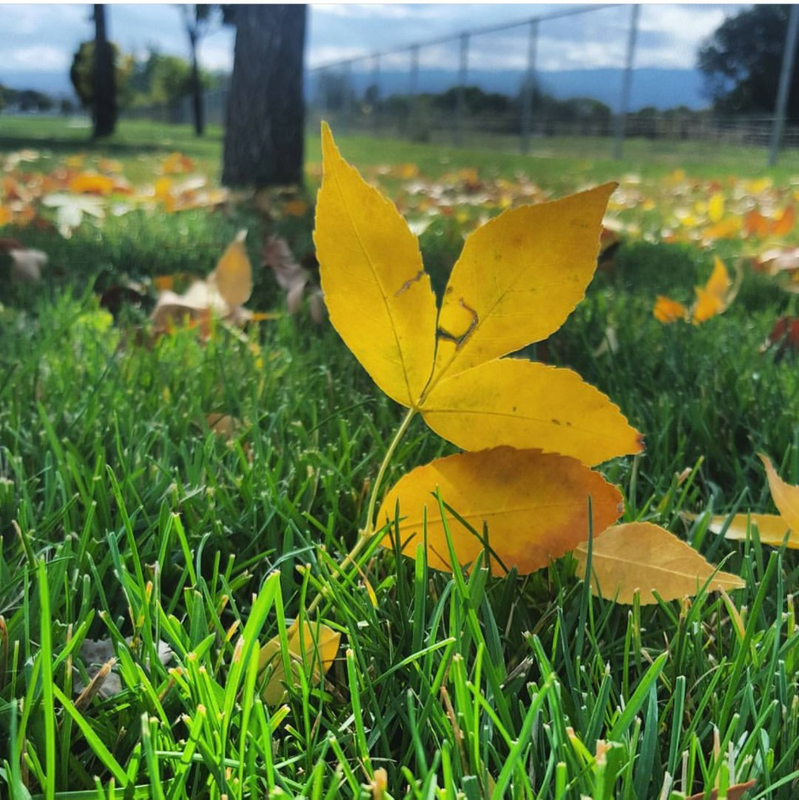 Fall is here!Today is the first official day of autumn. Leaves are starting to fall at Long Family Memorial Park. 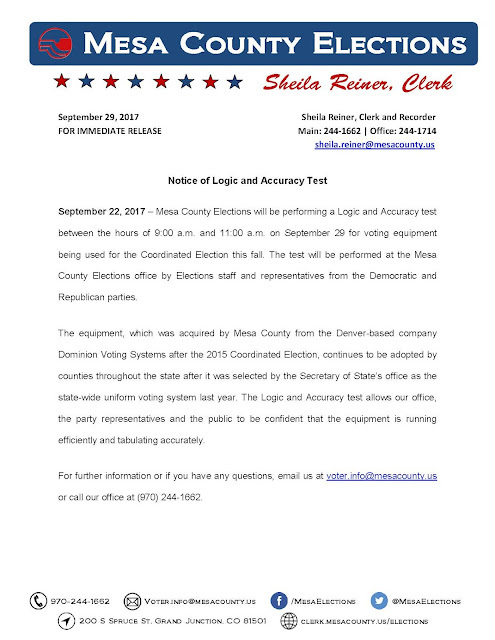 Elections will be performing a Logic and Accuracy (L&A) Test Friday, Sept. 29 from 9 a.m. to 11 a.m. at the Mesa County Elections office, 200 S. Spruce St. The Mesa County Criminal Justice Services Department (CJSD) is expected to move female offenders to the newly remodeled women’s community corrections facility, also known as Chipeta, by the end of the month. The 9,100-square foot, 41-year-old, building at 436 S 7th St., has been under construction for just under a year. The much-needed renovations address plumbing issues, lack of space and safety concerns for clients and staff for less than $409k. Chipeta houses direct sentence community corrections female offenders and female offenders transitioning out of the Department of Corrections. Clients are required to complete individualized case plans, including treatment, while also working and paying for their room and board. Treatment services include gender-specific substance abuse therapies, cognitive behavioral classes, dual diagnosis treatment program, anger management, and budgeting, to name a few. Clients may also access services in the community for parenting, mental health, and medical needs. For more information, visit http://cjsd.mesacounty.us/template.aspx?id=4437. 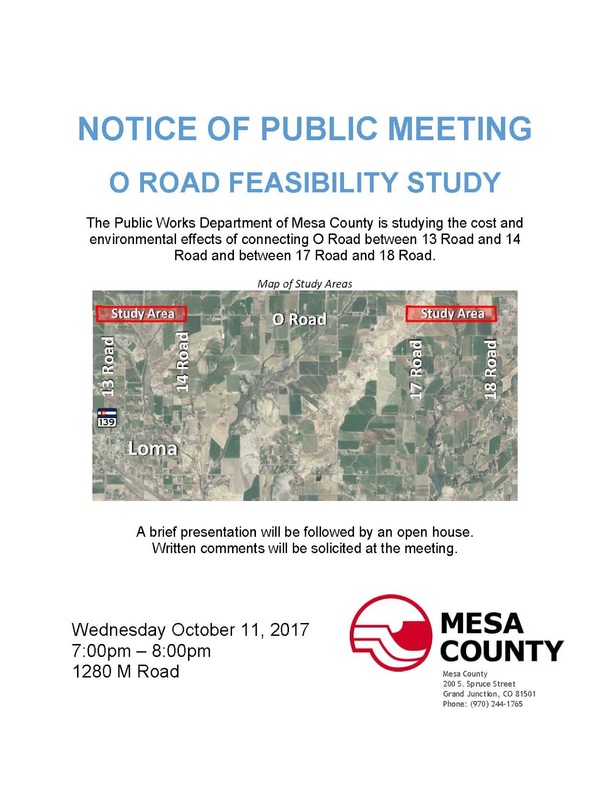 Mesa County Public Works is studying the cost and environmental effects of connecting O Road between 13 and 14 roads and between 17 and 18 roads. Residents are invited to an informal open house Wednesday, Oct. 11, from 7 p.m. to 8 p.m., at 1280 M Road in Loma, to talk about the study area and project. The open house aims to share information regarding the study and gather citizen input. A brief presentation will be followed by the open house. Community members are encouraged to attend. Monday, August 18, 2017, Mesa County Commissioners proclaimed September 17-23, 2017, as Constitution Week in Mesa County. Constitution Week is a reflection of the many benefits of our Federal Constitution and American citizenship. Katey Kelly, Regent of the Orchard Mesa Chapter of the National Society Daughters of the American Revolution, accepts the Constitution Week Proclamation from the Mesa County Board of Commissioners. The National Society of Daughters of the American Revolution is a non-profit service organization who's mission is the historic preservation, education, and promotion of patriotism. Read the full proclamation here. Commissioners honor former Colorado Parks and Wildlife regional manager for the northwest region in public hearing on Monday, August 18, 2017. Ron Velarde served with integrity and distinction through June 30, 2017. Mesa County Commissioners John Justman (left), Scott McInnis, and Rose Pugliese (far right), present Ron Velarde (center) and his daughter Megan, with a proclamation in honor of his 47 years of public service. Many Colorado Parks and Wildlife staff members came to public hearing in support of Ron Velarde and his admirable leadership and devotion to all who know him. Ron Velarde expresses his gratitude to the Board of County Commissioners for their many years of collaboration. Ron received a well-deserved standing ovation at public hearing from all who attended. Read the full proclamation here.